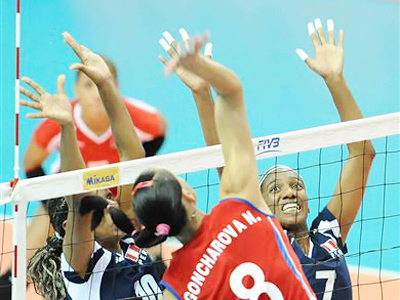 The Russian women’s volleyball team have grabbed yet another victory in the second stage of the FIVB World Grand Prix, which is taking place in China. ­After beating Germany 3-0 on Friday, Vladimir Kuzyutkin’s girls left no chance to their opponents from Peru, beating them with the same 3-0 scoreline (25:20, 25:17, 25:17). Katya Gamova one once again was the MVP for the Russian team, collecting 13 points – nine on the attack, three on the serve and one more on the block. The World Champions, who are so far undefeated in this year’s World Grand Prix, face their first serious test in the face of hosts China on Sunday.